Pink eye requires a medical examination. Learn treatment tips based on the nature of your infection to help heal pink eye faster. Pink eye or conjunctivitis is an infection or irritation that causes the conjunctiva or mucus membrane of the eyelid to become inflamed. Viruses, bacteria, dry eyes or exposure to irritants such as allergens, chemicals, smoke or fumes can cause pinkeye to occur. This typically clear lining will appear red and swollen. Itchiness, swelling, or discharge from the eye will often accompany this redness. This is a common infection and can easily be treated and eradicated within 7-10 days with the proper medical assistance. The type of treatment will depend on the underlying cause of the irritation. An infection caused by bacteria or a virus should be examined by a doctor. They will determine the best course of treatment for eliminating the swelling. Bacterial conjunctivitis will typically be treated with topical antibiotics. Those suffering from viral conjunctivitis will typically need to wait for a few weeks for their symptoms to pass. In the meantime, topical antihistamines or decongestants can be used to help manage your symptoms. If caused by eye allergies, your doctor can prescribe topical antihistamines that can reduce this reaction. Pollen, pet dander and dust will frequently cause such a reaction in those that are susceptible to allergies. Over the counter eye drops are also available to provide allergy sufferers with quick relief. 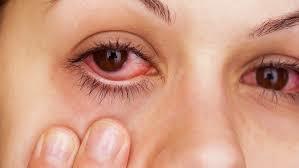 How to get rid of pink eye? Home remedies can also be used to keep your pink eye symptoms under control. Close your eye and place a compress over the effected eyelid to help take down inflammation. A warm or cool compress can be used depending on which appears to have more of an effect. Do not apply excessive pressure when placing the compress as this can further irritate the eye. Those with viral or bacterial conjunctivitis should be sure to immediately wash the cloth used for the compress to prevent spreading the infection to others. Bacterial infections of the eye can easily be spread throughout your body and to others, so it is vital to start antibiotics as soon as possible to clear the infection. While you may be able to generate some comfort at home with over the counter drops and compresses for your eye, it is important to seek medical attention for this condition to prevent any permanent damage to your eye. How to get rid of pink eye? You should seek out medical assistance when a pink eye infection occurs. While you may assume you have a case of pink eye, there may be an underlying cause that is leading to your inflammation which will require more extensive medical treatment.